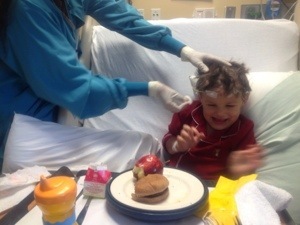 Back in April, you may remember me telling y’all about a “seizure-like episode” that Cannon’s little brother, Townsend, had. 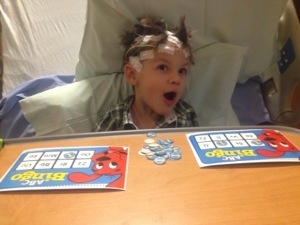 I told you about the EEG that followed and later that it had been read as normal. We were so thankful. 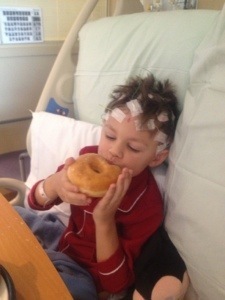 However, his neurologist was not content with the fact that he has had 2 EEG’s now and wouldn’t go to sleep in either. 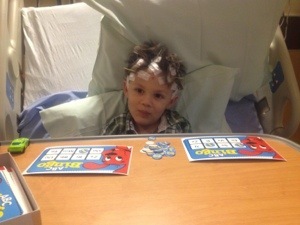 So, we came to the mutual decision to admit him to the hospital for 24 hours and use a special video EEG monitoring room. Cannon had had to do this a couple of years prior so we were familiar with it. 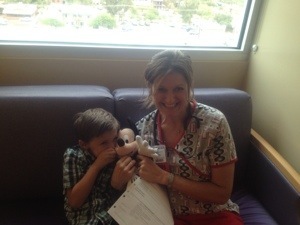 About 2 weeks ago, I brought our little man to the hospital and got him all checked in. Then, came the hook-up. Which isn’t the easiest…… and he was not a fan. His head is first measured in every which way and marked all over with red Sharpie. The leeds are then attached with some goo and a strip of gauze soaked in a solution is placed over the top. Finally, they use a tool that blows cold air onto the gauze to dry it. IT STINKS! I mean, it really smells. That was what bothered Townsend the most. Most especially the ones that came really close to his face. Poor buddy! It was tough but he got through it and was VERY happy when the tech gave him a car as a prize afterwards! When that part was done and the conductive jelly was placed in the hole of the leed, the tech took us back to our room and hooked us up. Townsend would need to stay in bed for the next 24 hours except to go to the bathroom in his room. We kept him busy watching movies, reading books, playing with play dough, painting, coloring, making sand art, playing with the iPad and other games, and so on. 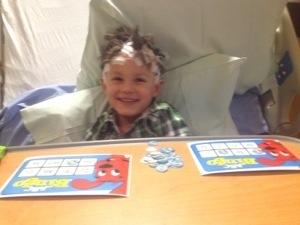 It really wasn’t so bad as he is our happy go-lucky kiddo. Here are a few pics of our goofy boy and his various faces. 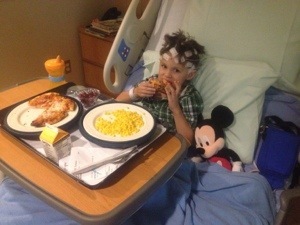 His favorite part of being in the hospital (sadly) was the food. We eat VERY healthy at home so being able to have a doughnut with breakfast, pizza for lunch, and pudding with dinner was a serious treat! He really hated getting the leeds off. They basically use nail polish remover to soak the gauze off. And it takes a while for each one to release. The shower, multiple hair washings, and draggings of the comb through his hair that follow aren’t much fun either. But, we got through it. And we were lucky enough to have a fave nurse from Cannon’s days roaming the halls of this hospital who goofed off with him a bunch and kept things fun! When we left the hospital, we did not have any results yet. Which was a bit different from the last time so that was a bit of a bummer. It actually took over a week and a couple of phone calls to get a call back. And when it came in on a Saturday and was the Neurologist himself, I was worried. We were so sure this last episode was nothing but a bad fainting spell. A vasovagal event as they call it. 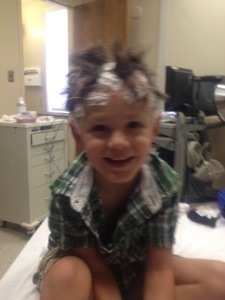 This video EEG was just to be thorough. 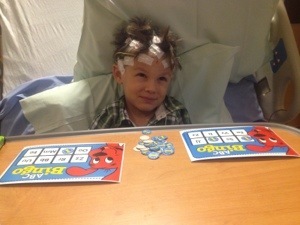 The Neurologist did not expect to find anything. But he did. Unfortunately, he found some abnormal electrical activity during Townsend’s sleep. Specifically, as he was falling asleep and as he was waking up. Which makes sense, as his seizure 2 years ago occurred as he was rousing. 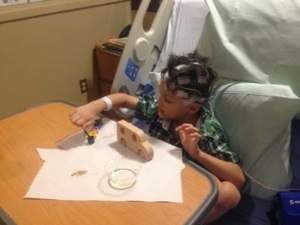 And also means that he could have had this problem all along but because he did not fall asleep in the EEG 2 years ago or 2 months ago……we didn’t catch it. 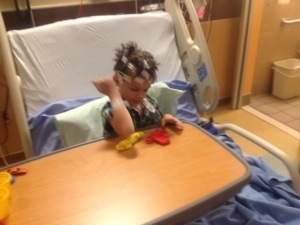 Protocol at this point is to get an MRI of the right side of his brain (where the abnormality was found). And to do more video monitoring. So, we are in the process of getting all of this approved by our insurance and then we will get things scheduled. Probably separately. 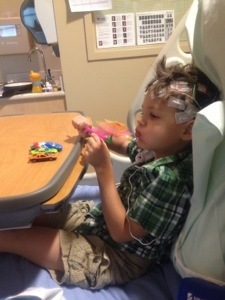 The MRI being done outpatient and the 3 additional days of monitoring will obviously be inpatient. Being perfectly honest with y’all……this stinks! We are sad and disappointed. 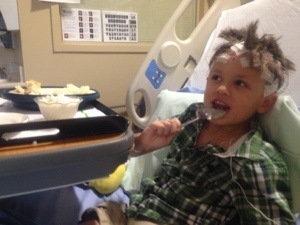 This was not supposed to happen to our healthy child! I sometimes feel like I can’t have more on my plate and now THIS! BUT……we also serve a God who knows exactly how we feel, exactly what is going on, and has a specific plan for our Townsend. A God who promises us that He will not give us more than we can handle, that He will be there through every step, and will work ALL things for our good. We take so much comfort in that! We choose hope! We choose faith! We choose to trust! Because HE IS! We thank you for following our journey as a family! When this blog journey began, it was all about Cannon. But now, I guess, it’s Townsend’s turn. LOVE TO ALL!